When a multi-billion dollar pharma company’s carton insert line fell short, they began manually inserting inserts with the help of a dispensing machine. However, they soon found issues with missing inserts, causing several customer complaints. To counteract the missing inserts, the company did 100% manual inspections on millions of cartons each year – utilizing excess time and money. After learning of the situation, one of Nosco’s Packaging Advisors proactively reached out to company executives to address the challenge. He recommended Lit-a-Sure as a 1:1 solution. 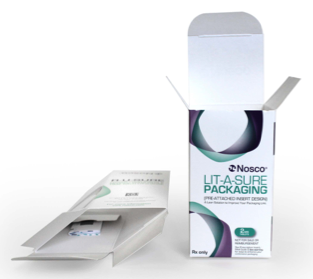 The Advisor explained that Nosco’s standard Lit-a-Sure product was adjusted to accommodate the company’s varying carton and insert structures, and was later pre-attached to the inside of each carton. “The company really appreciated that our in-process procedures were thorough and three-fold: the scanning of a barcode to ensure correct inserts, camera checks to confirm insert placement, and thermal camera checks to detect the presence of glue,” he said.